Martha shares notes on last week's Republican Party Convention fumbles, Russ Feingold's and Tom Nelson's new Ads, Voter ID Chair Update, Snapchat, and this week's Democratic National Convention in Philadelphia. MADISON - What a week it has been. We all watched the Republican Party fumble through their convention, leaving us wondering what’s next. Melania Trump seemed to love Michelle Obama's message, and Ivanka Trump’s speech seemed much more like a Democrat's speech then a Republican's. It all seemed so discombobulated— and then Donald got up there and described our country like it was Gotham City. My conclusion: the Republican Party is a mess! Lucky for us, we’re Democrats! This week I have a few campaign updates, a rundown of the Republican campaign, a teaser for the Democratic National Convention, which starts Monday, a new fun way to stay in touch, an update on voter ID, and a few dates to keep in mind for the future. Russ put a new ad out this week, and it shows exactly why we need Russ in the U.S. Senate: he is a leader with real solutions. In an ad entitled “Tough,” Russ lays out his strategy to defeat ISIS and keep America safe without making the mistake of getting involved in yet another long, bloody, and destabilizing ground war in the Middle East. Empty Republican rhetoric about carpet-bombing the Middle East and killing the families of terrorists makes America less safe and does not bring us any closer to an actual solution. Russ’s plan to go after ISIS’s oil, money, and weapons, and to use targeted military force, to improve intelligence operations, and to build a coalition of Middle Eastern nations to confront the jihadists on their own turf is tough, realistic, and smart. At home, Russ wants to give law enforcement and the intelligence community the resources they need to track down terrorist cells and break them up before they get the chance to do damage. While Republicans waste valuable time grandstanding, Russ, a proven leader on national security, has been busy crafting a real plan that represents our most effective strategy to eliminate the terrorist threat and keep America safe. Tom Nelson, who is running for congress in the 8th District, also debuted a new ad this week. Nelson stated in his ad, “This is where I lead our country, doing what government is supposed to do: work together, protect seniors, [and] balance our budget." Tom Nelson believes in representing the true interests of hard-working people of northeast Wisconsin. Throughout his career he has never lost sight of what is important, and I am confident he will continue to work hard for all Wisconsinites, regardless of their political affiliation, in order to create an efficient state government that focuses on job creation, balancing the budget, and protecting seniors. Our state needs to elect Democrats like Nelson up and down the ticket this November in order to improve the quality of life for Wisconsinites. I am proud of Wisconsin Democrats like Tom Nelson for their dedication and hard work, and I am excited for the work and effort they will make to improve our great state of Wisconsin. Going into this week, we were expecting a veritable circus in Cleveland— but the GOP has outdone itself with the sheer extent of spectacle it's provided. I'll give a quick day-by-day run through of the best, worst, and ugliest moments of the Republican National Convention. Internal divisions quickly became external as the RNC promptly ignored calls for a roll-call vote over convention rules by delegates, prompting objections and unrest while the Iowa and Colorado delegations stormed from the hall. A plethora of featured speakers, ranging from former New York Mayor Rudy Giuliani to Willie Robertson of Duck Dynasty to actor Scott Baio, spilled hateful rhetoric against immigrants and Muslims and decried political correctness as the end of American greatness. Melania Trump took the stage with a keynote address in which she vouched for her husband's character, interspersing her speech with comments plagiarized from Michelle Obama's speech at the 2008 Democratic Convention. By the end of the evening, freshman Iowa senator Joni Ernst was left to speak to a near-empty hall: even the delegates had grown weary of the same tired hypocrisy and bluster we've been hearing from the GOP for years. GOP leaders arrived at the convention hall Tuesday for an evening focused on "Make America Work Again," a presentation during which speakers avoided any form of quantitative policy discussion in favor of launching attacks at Hillary Clinton and the Obama administration. Tuesday also brought Paul Ryan, one of Wisconsin's own extreme partisans, to the forefront of the convention to promote his "Better Way" economic program— ignoring the fact that he has been a do-nothing congressman since he was first elected in 1999. If Ryan got the agenda he wants, there would be more privatization of education, healthcare, infrastructure, and social services, and we would have an economic system in which success is reserved for the 1%. Similar to Ryan, Trump is pushing his own extreme agenda that would abandon what's best for the American people. Tuesday's itinerary just proved once again that the Party of Lincoln has abandoned their principles to become the party of ego expansion, economic exclusion, and conspiracy theories over political policy. If possible, "Make America First Again," Wednesday's debacle of a program, beat out even Monday's mess in terms of exposing party schisms and further expressing party leaders' hypocrisy and bluster. GOP nominee runner-up Senator Ted Cruz brought down the house when he pointedly refused to endorse Donald Trump and instructed Republicans to "vote their conscience," which resulted in Trump supporters booing him off stage. Trump's VP Mike Pence offered a speech as uninteresting as his record on improving access to education, childcare, and healthcare in Indiana. And Governor Scott Walker took the stage to demonize and scapegoat hardworking Wisconsinites, falsely boasting about how well Wisconsin is doing. At this point, his blatant warping of facts to suit his own narrative doesn't even surprise us— we've watched him lie his way through his political career in Wisconsin. Seeing Walker take his place cozying up to Trump just proves what we've known all along: he is just another politician looking to help himself and not the people. The Republican National Convention ended the way we all imagined it would - with Donald Trump laying out his dark and hateful vision of America that is dangerous and does nothing but divide us. He repeatedly peddled debunked lies, demonized minorities, and spoke about a future America that is divided, not united. It reinforced what we have known all along: Donald Trump is dangerous and does not have the temperament to be President of the United States. Check out this video that says it so well: a letter to Donald on why we don’t want him to be our President. Friends, next week proud Democrats from all over our amazing country will come together to nominate Hillary Clinton as the next President of the United States. We could not be more proud of our nominee and the unity we have seen from our party. Bernie Sanders and Hillary have demonstrated what voters really want from their elected officials: for them to collaborate, negotiate, and make progress together. That is exactly what is happening. Next week, our platform will be presented to the delegation, and Hillary and Bernie both approve of it. Our convention is an opportunity to show the American people how great our vision for the next four years is. Democrats up and down the ticket will share our hope for equality, fairness, and an America where everyone can live in prosperity. Please make sure to tune in to see our incredible lineup of speakers as they work to excite the American people and ensure, come November, we elect the first woman president. We are stronger together and next week we will show the American people why! Have you ever wanted to attend the Democratic National Convention? To see what happens off-camera and behind the scenes? This year, at the national convention, the Democratic Party of Wisconsin will be providing an inside look through our Snapchat channel. Download the Snapchat app, follow us at WisDems, and stay up-to-date on all the latest happenings of the convention by following pictures and videos of the beloved Wisconsin Cheesehead throughout Philadelphia. * I, along with my fellow staff members at DPW, am excited to experience this milestone convention— and we want to share it with all of you. *No, you are not too old to try this! If I can do it — you can too! On Tuesday, a federal judge ruled against the discriminatory voter ID law that Governor Scott Walker had signed into law in 2011. Now, anyone who could not previously vote because of a lack of proper ID can sign an affidavit, verifying they are who they say they are. 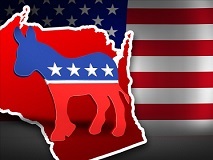 Before this ruling, in order to vote, the law required all Wisconsin residents to show documents that prove one’s identity or proof of residence. These requirements made it significantly more difficult for minorities, students, homeless citizens, and low-income voters to cast a ballot. U.S. District Judge Lynn Adelman ruled that these groups were treated unfairly, and that the voter ID law imposed an “undue burden” on the constitutional right to vote. On his never-ending crusade to suppress the vote, Scott Walker ordered Wisconsin's Attorney General Brad Schimel to oppose the ruling. Walker and the Republicans have purposefully suppressed the vote— just look at the comments Glenn Grothman made saying it could help his party win in November. The right to vote is sacred, and it is shameful that Scott Walker is fighting people's constitutional right to have their voice heard at the ballot box. Thank you to all the donors who have made it possible to open campaign offices across the state. Here is a complete list of the offices we have open or will be opening soon. I was so happy to attend the Madison and Appleton openings this week. The energy and excitement in the room showed me our state is engaged and ready to elect Democrats up and down the ticket this November.